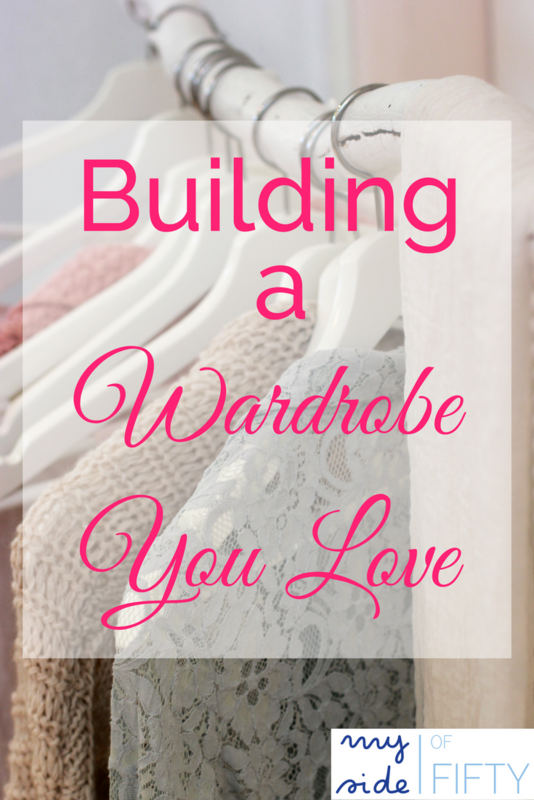 Building a Wardrobe You Love. Do you wonder how they do it? Your friends who always look so cute and put together? A year ago, my closet was filled with a wardrobe that I DID NOT LOVE. Not even close. Sometime in my 50’s I forgot how to dress myself. I had nice clothes. That I spent a lot of money on. Yet, I didn’t like how I looked in any of them. I felt fat, unattractive and anything but confident. What was wrong? When I was younger, I used to dress really cute. Shopping was fun. Everything fit and most styles looked good. 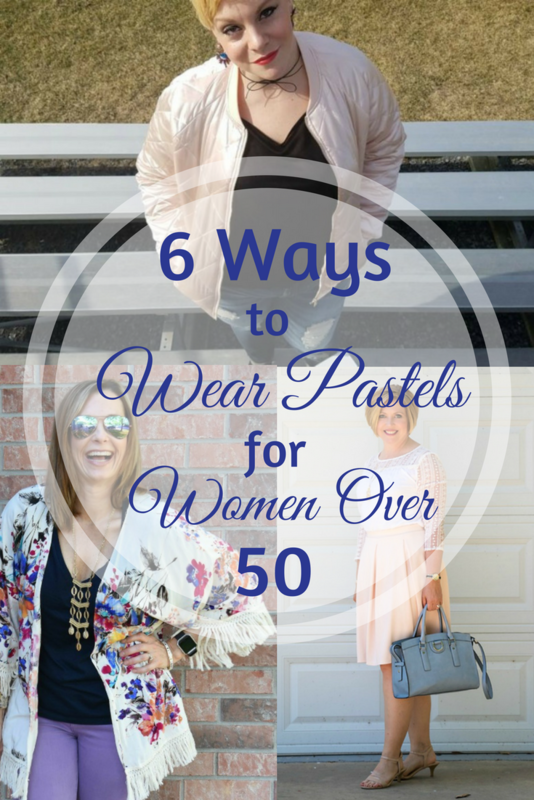 When I reached my 50’s, my adult daughters would shop with me and that was a help. But they were more well-versed in what was “current”. Not so much about what was flattering for my body type. And what the heck WAS my body-type anyway? 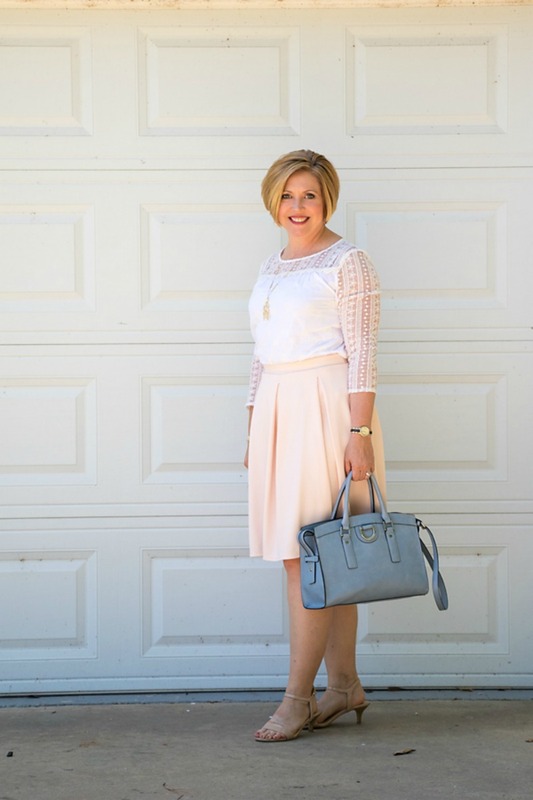 And last fall, that was exactly what she did for me through her Adore Your Wardrobe eCourse! I loved it so much that I became an affiliate, which means if you purchase the course through my link, I will receive a commission at no extra cost to you. But I would recommend AYW even if they DIDN’T have an affiliate program. 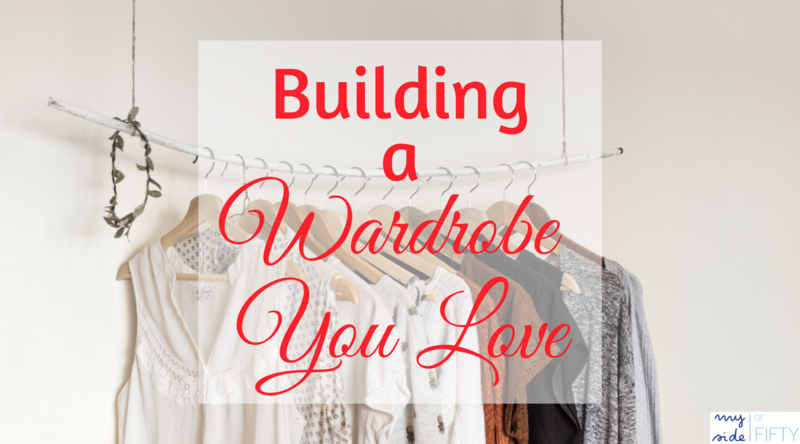 The Adore Your Wardrobe eCourse is a 30-day course that will change the way you think about fashion and your wardrobe. This nine module (and one master class) course contains videos, written overviews, and worksheets to help give you the skills to become a killer fashionista. 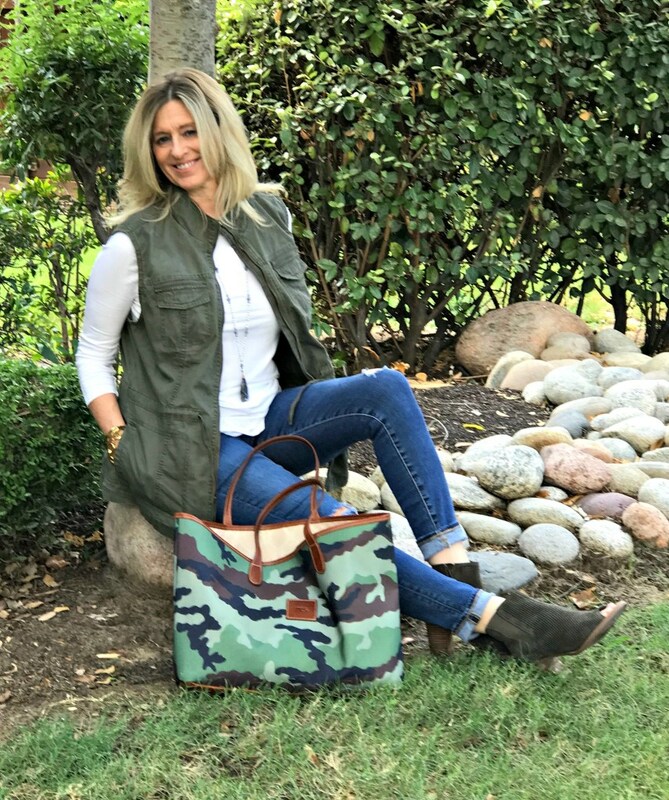 Every few days, you will receive an email from Kelly with an overview of the day’s lesson, as well as a mini-challenges to help build your confidence and feel successful in your ability to create a great-looking outfit. PLUS: Exclusive access to our private Facebook group to connect with and encourage each other as we walk this path together! I found out what my body-type REALLY was and learned exactly what cuts and length of tops and pants were most flattering on me. Again – not what I thought AT ALL. The types of clothes I was purchasing for my body-type were adding so much extra bulk to my frame. No wonder I felt fat and frumpy! 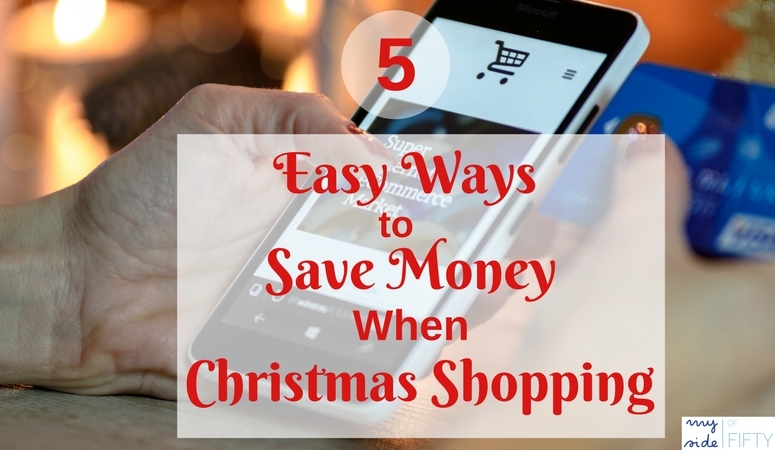 Since I know EXACTLY what to look for, shopping is a breeze. I don’t take a gajillion things into a dressing room, try them on and hope for the best. I choose only the things I know will be flattering and have a much greater chance of walking out of the store with pieces I love. I don’t waste money on clothes that are not going to work. I’ve learned how to bring attention to my best features with my clothing and accessories. I have fewer clothes, more outfits and I LOVE everything in my closet. 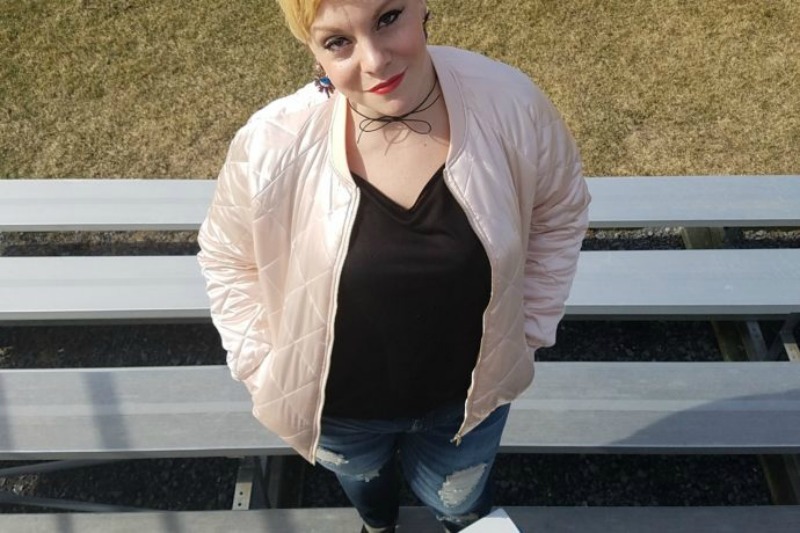 Through the exclusive Facebook group, I had access to AYW body-type experts who helped me as I put together new outfits and gave me important feedback on my outfits. This group is SO NICE! 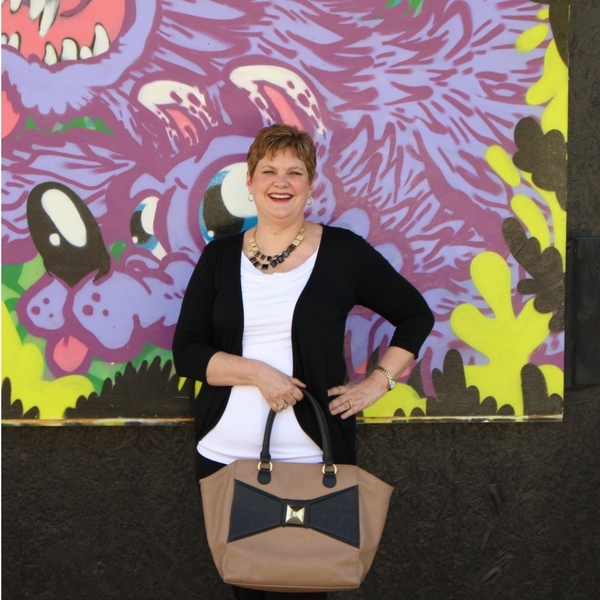 Enrollment for Adore Your Wardrobe only comes around twice a year. So get on the waiting list so that you’ll know the next time the course opens! We’re in the middle of the most festive time of the year where holiday parties and get-togethers with friends and family abound. It’s also the most fun time of year to bring out something special to wear. Something elegant, appropriate and comfortable. 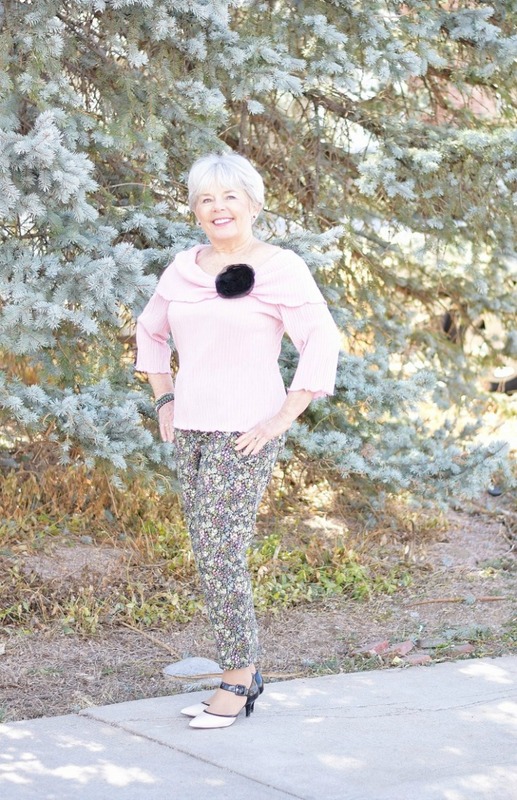 Here are my Holiday Outfit Ideas from Misook, a luxury line of knit clothing that features timeless silhouettes, sophisticated colors and are figure flattering for all sizes from XS to 3X! This post is sponsored by Misook. All opinions are my own. The Sequin and Sheer Jacket is the perfect statement piece for a holiday party, cocktail party or a wedding. It is totally luxe, can be paired easily with neutrals and is hand washable. It also comes in gold/black. 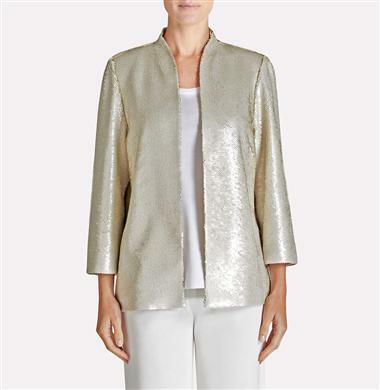 The champagne/gold Sequin Jacket is another show-stopper that can be worn year round. Pair it with light colored neutrals for your spring/summer events or darker neutrals for your fall/winter events. 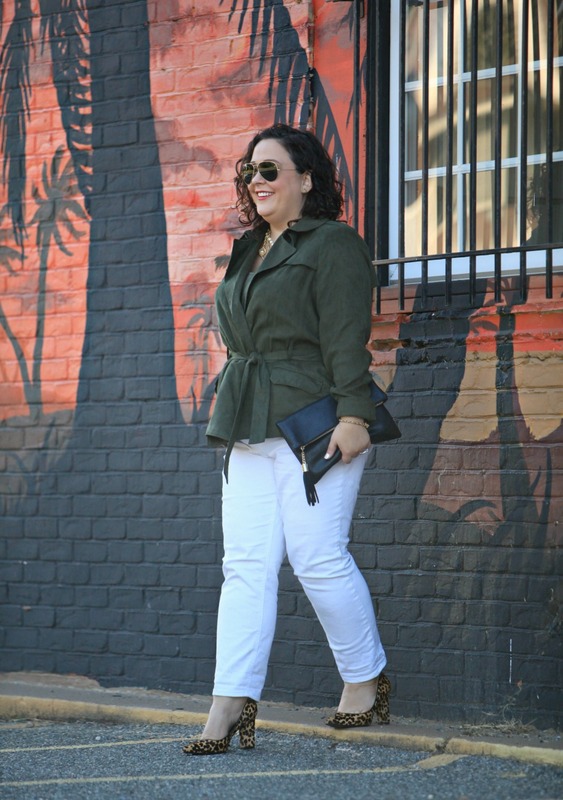 The open front, bracelet length sleeves and beautiful cut of this jacket are designed to flatter any figure. Red and Green are the colors of Christmas! The Tonal Pattern Jacket in cherry red with black trim is lovely and has just the right pop for a special celebration – hosting a Christmas party, night out at the symphony or date night with your special someone. 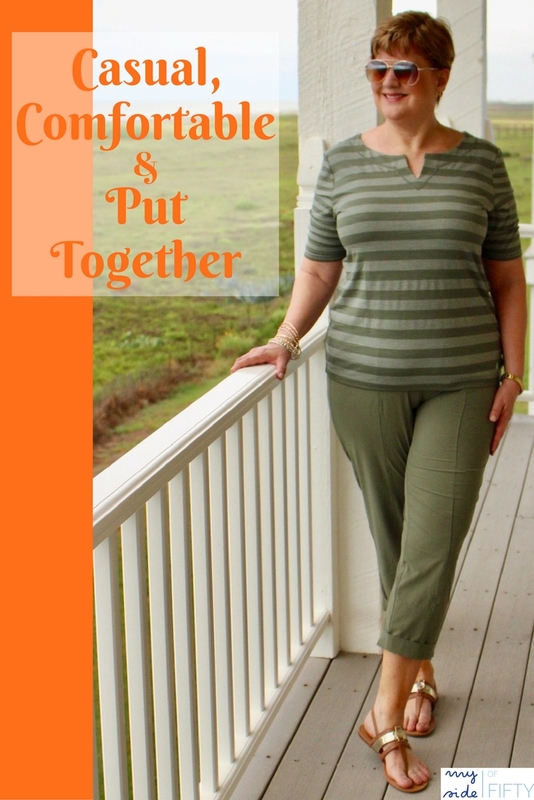 This silky soft knit is machine washable, wrinkle resistant and packs like a dream. Wear this Abstract Plaid Jacket in ivy when you want to be festive, but a little more subdued. Perfect for an after-work party, brunch or holiday luncheon. It’s also totally appropriate business attire for after the holidays. 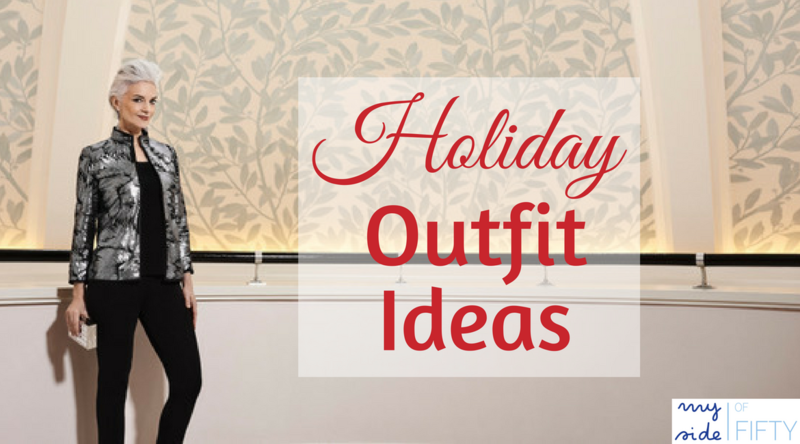 Holiday dressing doesn’t have to necessarily be “blingy” or in traditional colors. 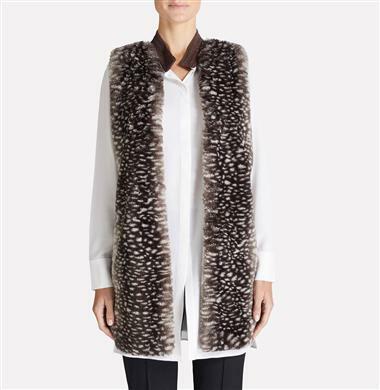 This leopard print, Faux Fur Vest is totally on trend and will take you from early fall right through winter. Pair it with anything from slacks to leggings to jeans. 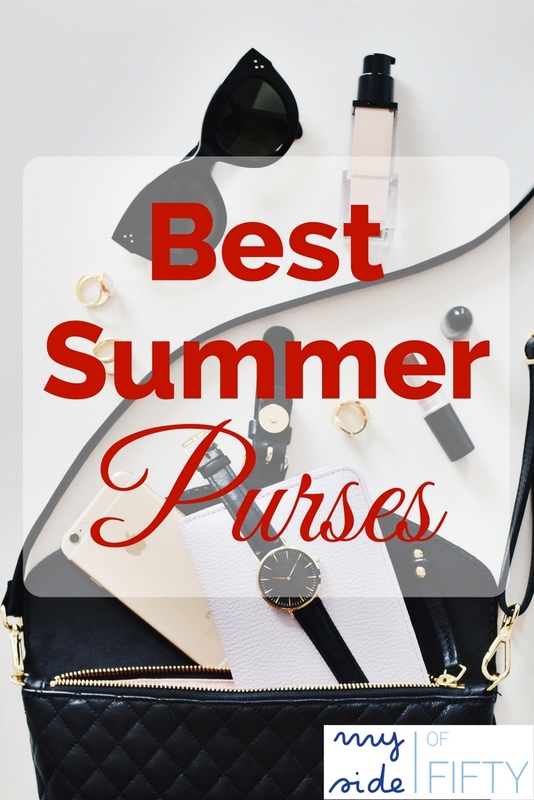 It promises to be one of your most versatile wardrobe pieces. And it’s on sale! Don’t you love these gorgeous pieces? Did you get a little bit of “sticker shock” when you clicked through and saw the prices? There was a time when I certainly did because I don’t typically spend that much on clothes. 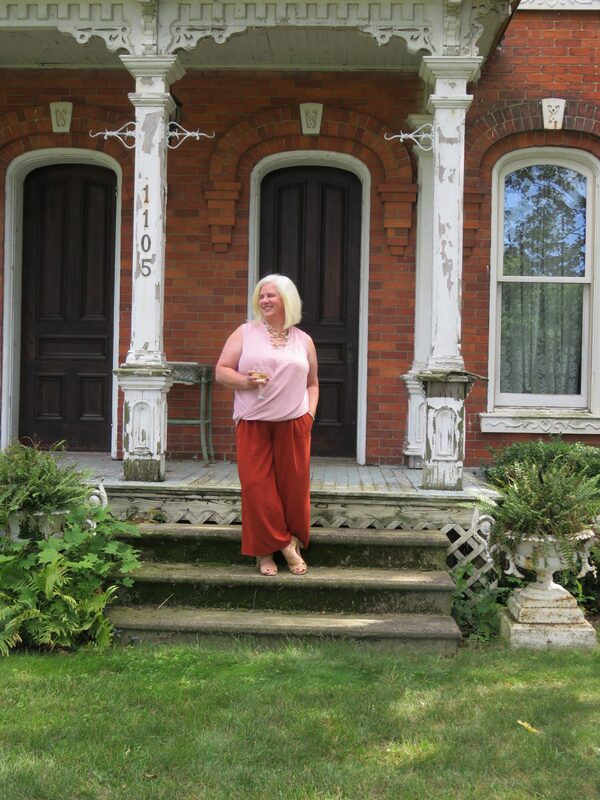 However, as I’ve revamped and refined my midlife style, I have come to see the wisdom in having a few well made “investment pieces” that I can wear in lots of different ways for many years rather than having a whole slew of trendy, less well-made items. Plus, Misook is offering 25% off their entire site with the promo code MSK1691, which helps to make their fashion more affordable! All Misook pieces are designed to be mixed and matched, season after season. They are classic pieces that won’t stretch or fade over time because each piece is knit individually rather than being cut from a large swatch of fabric. So if you have a beautiful item of clothing that is a classic silhouette, can be worn in a multitude of ways and is made to last for years, your actual price per wear comes out to be quite reasonable! Misook also carries and line of well-made fashion basics. Take a look at their pants, skirts, and dresses. Classic, versatile, easy care pieces from Misook! My choice for the holidays and beyond! Looking for new ways to tie a scarf? Get my 3 Fashionable Ways to Tie a Scarf here. I’m all about comfort. But comfort doesn’t have to mean pajama pants and a t-shirt. Take this look from Soft Surroundings. It’s tailored, dressy enough to wear for a business meeting, to church or a cocktail party and let me tell you – it’s comfortable. I call it Tailored Comfort. Let’s break it down. 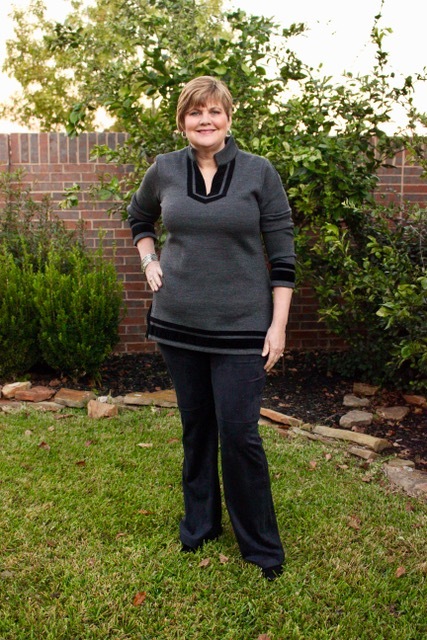 The Runway Pullover is a super warm tunic in a rib sweater knit. 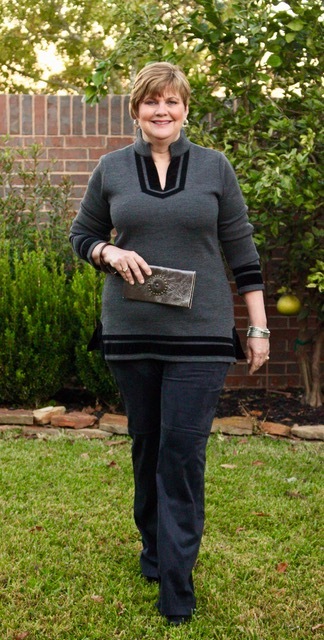 Unlike so many tunics that look super boxy on me, this one is more tailored, giving a much more flattering silhouette. The black velvet trim detail is on trend for fall. The sleeves are long, but I pushed them up to 3/4 length. It comes in Petite and Women’s sizes and in a couple other colors. Something for everybody. This top would look great over leggings or paired with jeans for a casual look. I chose the Ultra Soft Bootcut Pants. They are pull-on pants with an elastic waistband and the super-soft, luxurious fabric looks like suede. 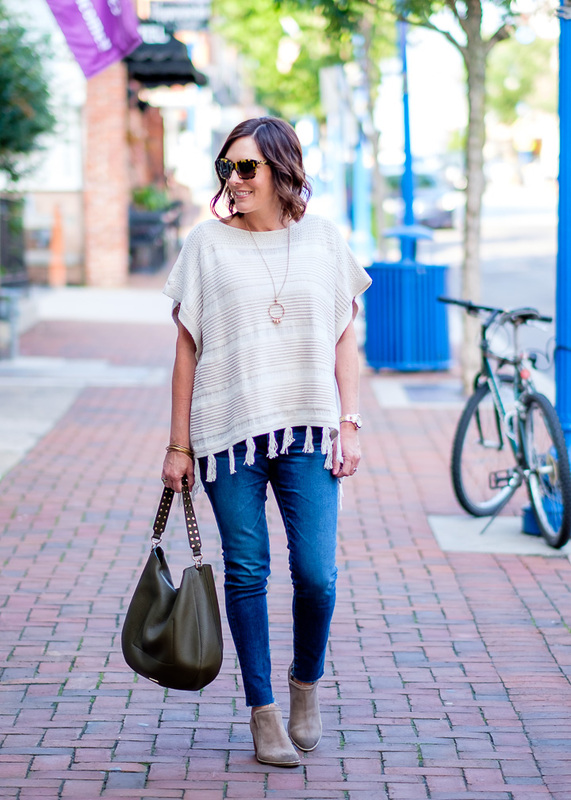 The bootcut style does a great job of balancing out my pear-shaped body! 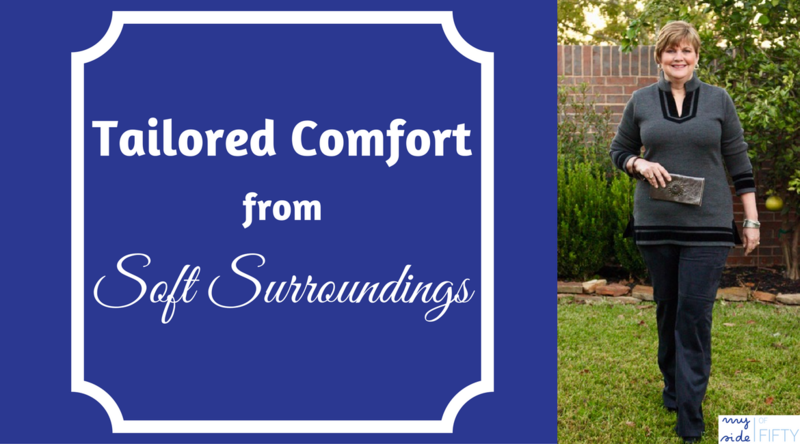 I have several pairs of Soft Surroundings pants & shorts. 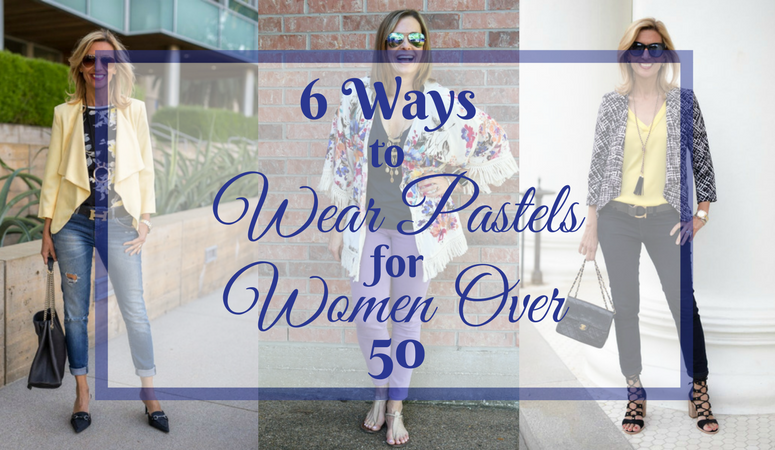 I especially like their Metro Leggings and have a pair of these shorts in every color. 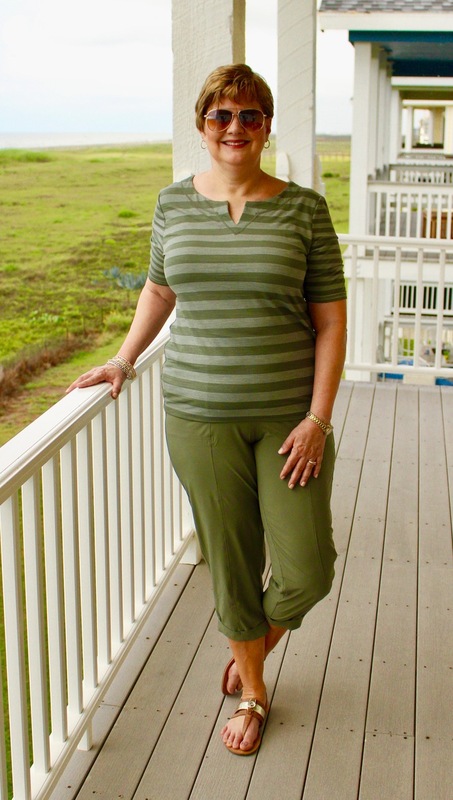 The designers at Soft Surroundings have a knack for making stylish pants with great details that just happen to have an elastic waistband. The fit and tailoring are so great, you’d never know they were pull-on pants. 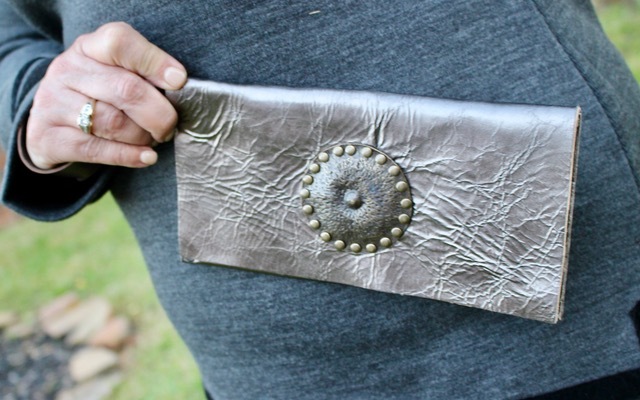 This Jenna Leather Clutch in silver is a GORGEOUS bag that goes great with the outfit. Look at that detail. Genuine leather and the perfect size for your lipstick, phone, and a credit card. Unfortunately, it’s no longer available. But never fear! If you love this clutch, I am giving it away to a lucky reader. Just subscribe to My Side of 50 between now and November 15 at midnight CST to be eligible for the drawing to win this clutch. 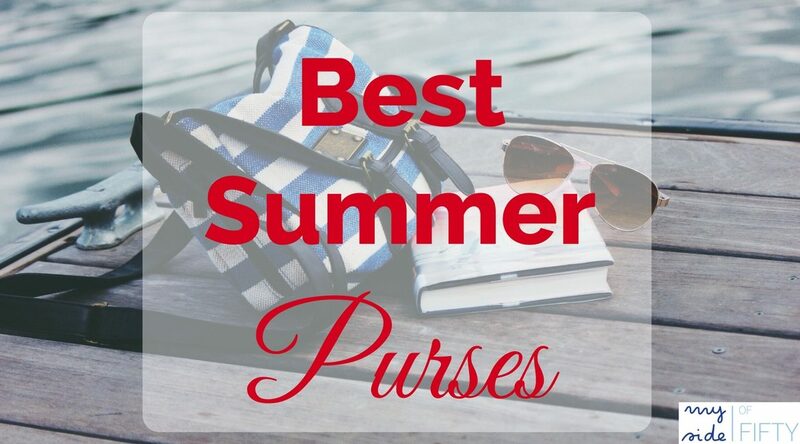 Check out some of Soft Surroundings other great bags here. On my wrist is the Shimmy Stretch Bracelet that comes in silver and gold. This is really 5 separate stretchy bracelets that can be worn separately, together or combined with other bracelets. 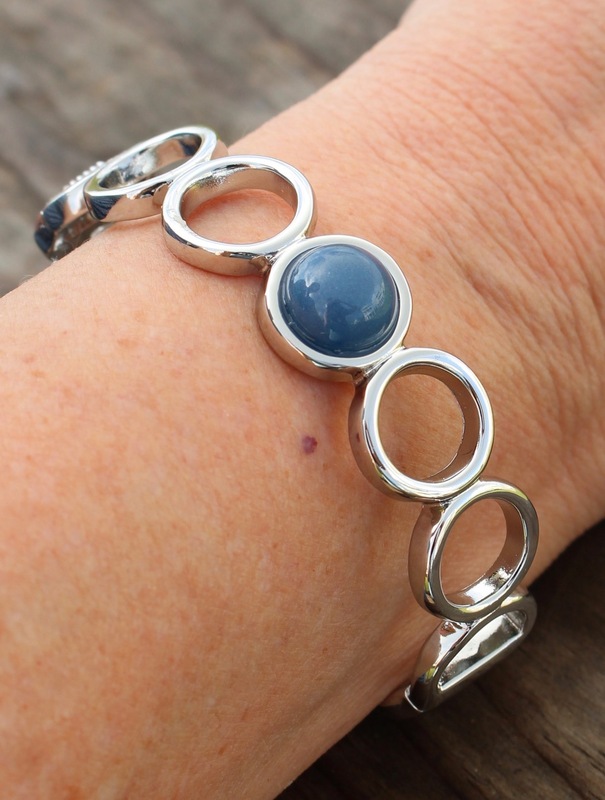 This bracelet gives you lots of options for many different looks. 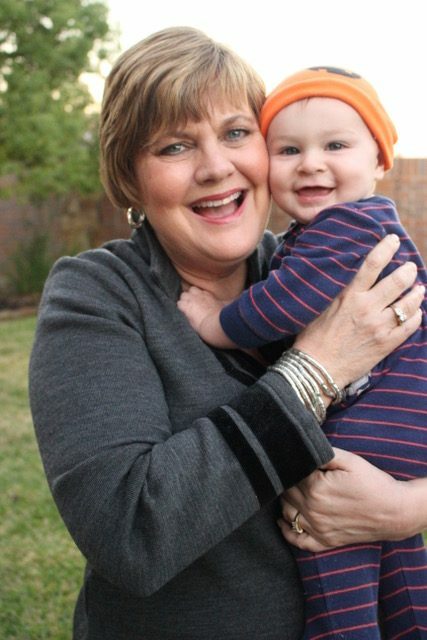 The other accessory (not provided by Soft Surroundings) is my grandson Jeffrey! Such a helpful little guy during our photo shoot! 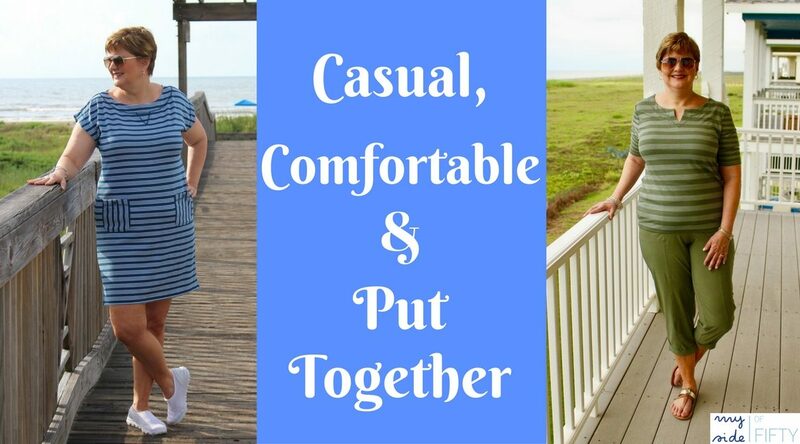 As a blogger and solopreneur who works from home, my daily attire is casual. Comfort is the top priority. But I also want to look put together. And I want my clothes to work whether I’m at home, running errands or out with friends. 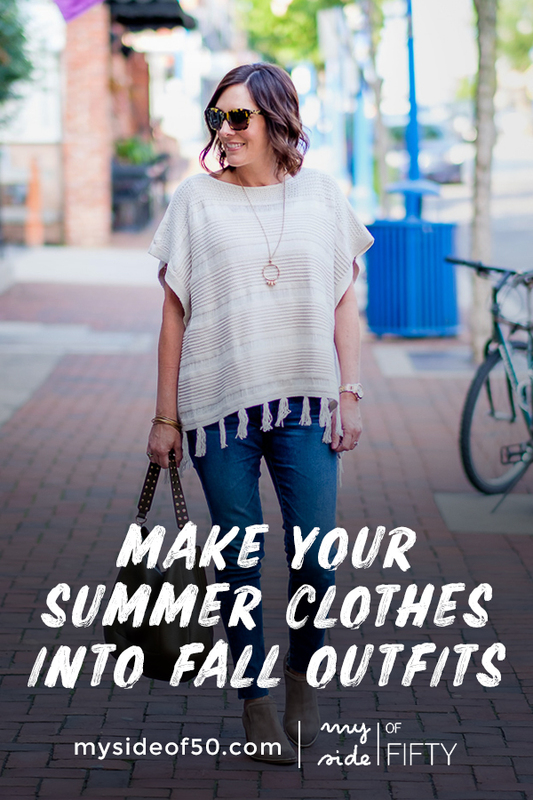 Enter T by Talbots. My regular readers know that I am a huge Talbots fan. I love the quality and fit of their clothes. Their always classic style fits my fashion personality to a “T” (pun intended). 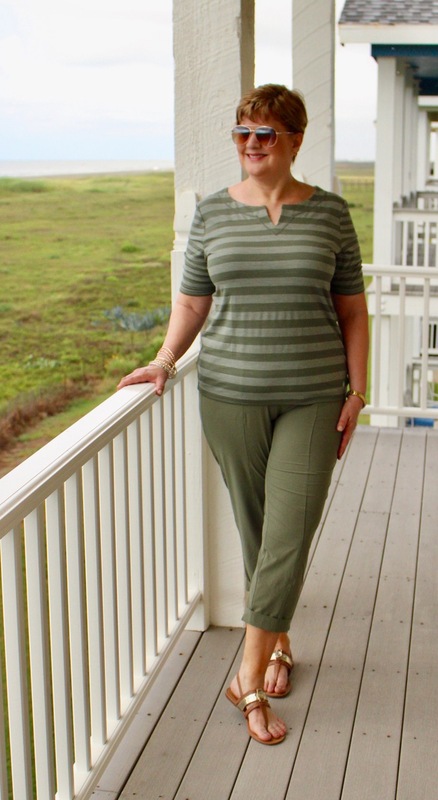 However, this is the first time I tried any of the T by Talbots line and I must say, I love these clothes. 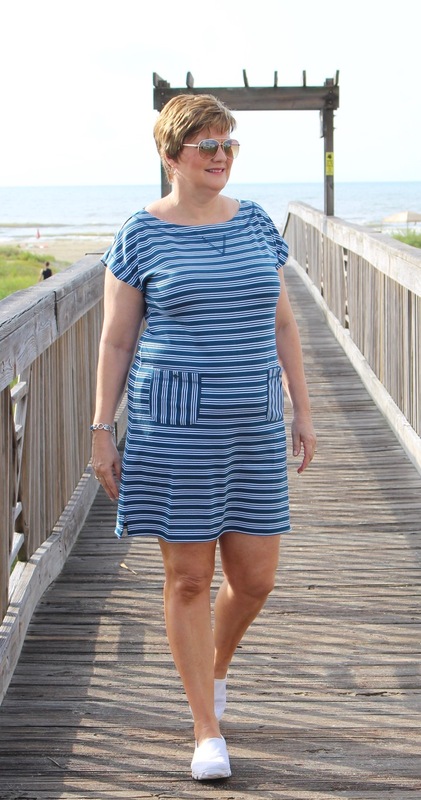 Talbots provided a gift card for me to purchase the clothing in this post. All opinions are my own. In the last 10 years or so, it seems I’ve gravitated away from dresses for some reason, except for special occasions like a wedding. 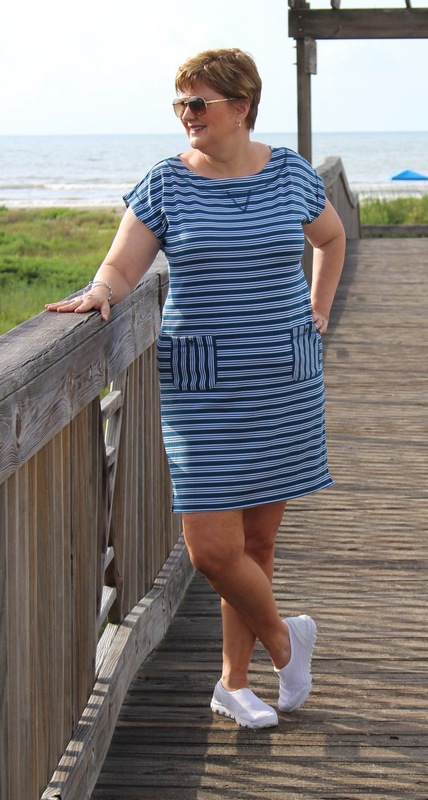 So when the staff at my local Talbots showed me the Triple Stripes Dress, I said, “Ok” to humor them, but in my head, I was thinking “This is definitely NOT ME!” I was so wrong…I put on this cute dress and had to have it. The soft jersey knit feels great. I like that the fit is loose, but it still has some structure so it doesn’t look like a tent on me. I’ve worn it after a day at the beach, to church and out to dinner. It’s something that I can put on in the morning and wear until bedtime because it takes me wherever I want to go. I also saw this cute Ring & Cabochon Bracelet in accessories that paired perfectly with the dress. This combination of the Mixed-Stripe T and Woven Roll-Cuff Crop with elastic waist feels like pajamas. They are so soft and comfortable. And I love this forest green color that is so on-trend for fall. 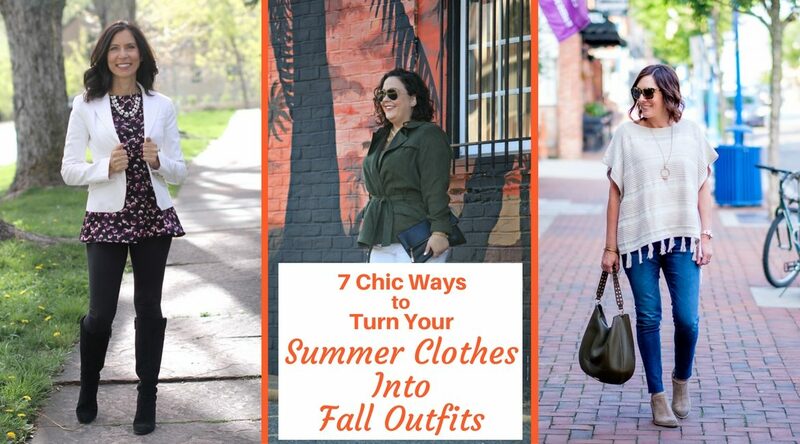 Since I live in Texas and we won’t see temperatures out of the 90’s until October, this outfit is perfect for this summer to fall transition period. The pants run a little big, so you may want to size down. 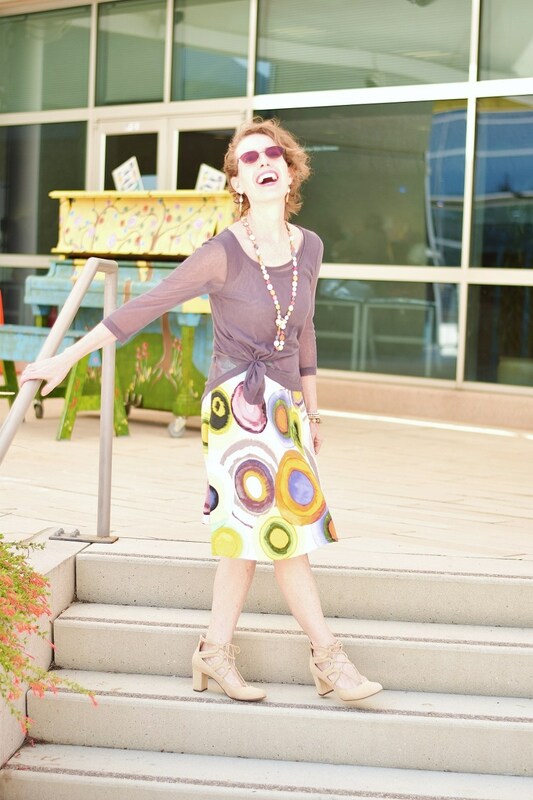 I’m wearing flat metallic embellished sandals here, but am thinking I’ll wear my leopard print ballet flats with this outfit when it cools off a little. 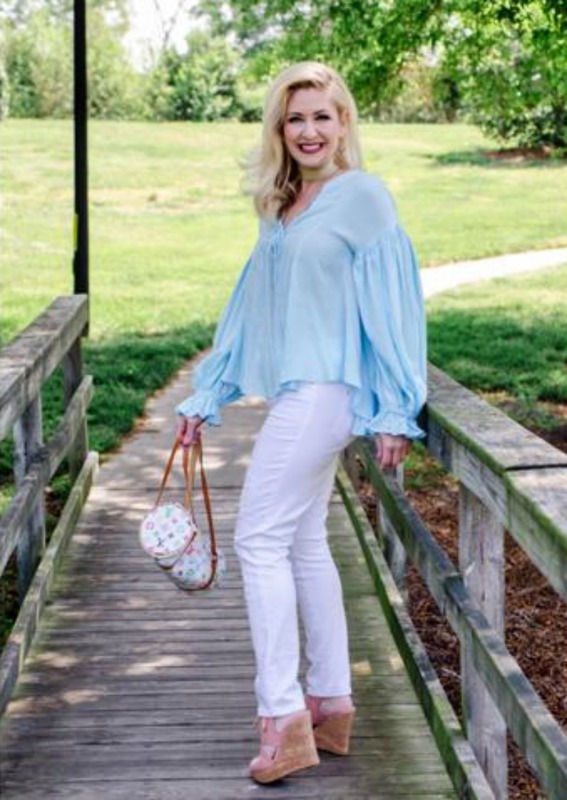 T by Talbots features tops, pants, dresses and jackets, all designed to take you effortlessly through the most casual moments of your life! All of these looks and more are ON SALE! I’ve been on a quest for cute shoes for women with wide feet for as long as I can remember. My mom had wide feet. I have wide feet. And for the longest time, I had to squeeze into shoes that hurt my feet because no one made cute shoes for women with wide feet! With the advent of online shopping, and retailers like Zappos, I can now find a much better selection when shopping online, but rarely find shoes that fit my 8EE feet in stores. Even stores like Naturalizer that carry wide-sized shoes don’t often carry them in their stores. I usually have to order them online. And even if you don’t have particularly wide feet, you may have developed foot problems that cause you to have to shop for shoes that will accommodate issues like bunions, hammer toes, and bone spurs. But no matter what your shoe size or the condition of your feet, wearing shoes that are too tight can cause skin irritations, superficial skin ulcers, corn formations and calluses on the ball of the foot! OUCH. And I don’t know about you, but when my feet hurt, I am miserable, so I don’t care how cute the shoes are – it’s not worth it. 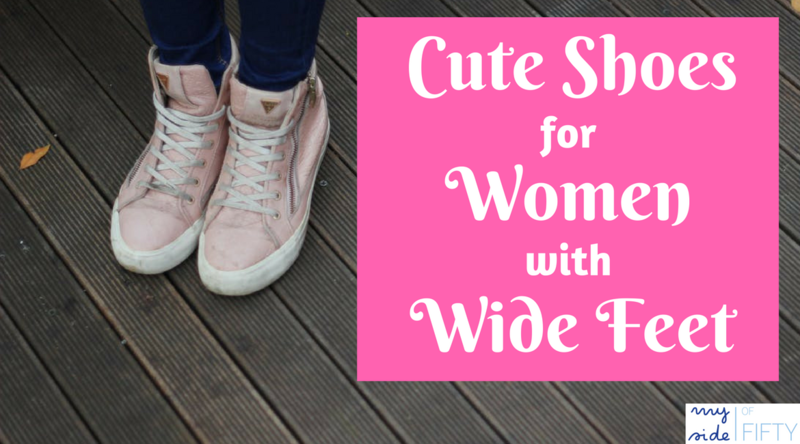 Fortunately, women with wide feet no longer have to choose between style and comfort since many shoe manufacturers now offer shoes in wide widths. My favorite place to shop for shoes is Zappos. They have a HUGE selection, FREE shipping & return, quick delivery and the most excellent customer service I have ever encountered! I LOVE FREE SHIPPING AND FREE RETURNS! I can order 2 sizes of the same shoe at no extra cost and then ship back the one that doesn’t fit. Check to see that there is enough wiggle room in the front of the shoe (the toe box) so that your toes are not cramped or feeling unnecessary pressure. If you see redness on the top or sides of your toes after trying on a pair of shoes, that is an indication that they are too tight. This could lead to corns, blisters and foot pain. Always make sure you have a thumbs width between your longest toe and the end of your shoe. Prevent corn and blister formation by using gel pads or toe caps around the tops and sides of your toes. Moleskin, Band-aids and metatarsal arch pads are helpful to reduce skin irritation and reduce callus formation. Massaging your feet with a moisturizing Foot Cream that contains ingredients such as Urea, Aloe, Vitamin E, & Chamomile will soften and hydrate rough, dry and fissured skin. Do this before you go to bed so that the cream will have the opportunity to be absorbed. Now on to the cute shoes. Don’t have wide feet? Not to worry – these shoes all come in regular sizes too! Be sure and click the arrow half-way down to see all the selections! Where is your favorite place to shop for shoes?